Satisfy yourself and your loved ones whether your kids or your family with such tasty and awesome chocolate cake recipes. Make it more appeal-able by giving choco chips on top. 1. Preheat the oven to 350 F. grease the cake tin and line the bottom with greased paper. 2. Beat the eggs thoroughly and gradually pour the sugar into it while beating the egg. Beat until it is light. 3. Melt the butter in a milk to make thin and warm liquid. 4. Sift together the cake flour, cocoa and baking powder and then pour it in the egg mixture. Mix it well. Add vanilla essence. 5. Add the milk liquid into it and blend quickly. 6. Pour the batter into the greased tin. Check there will be no air bubbles on the mixture, then knock it 3-4 times on the table. 7. Bake for 25-30 mins on 350 F. To check you can insert a skewer into the cakes and if it comes out clean, then your cake is ready. 8. Cool the cakes for few minutes and then remove it from the tin and place it in a plate. 9. 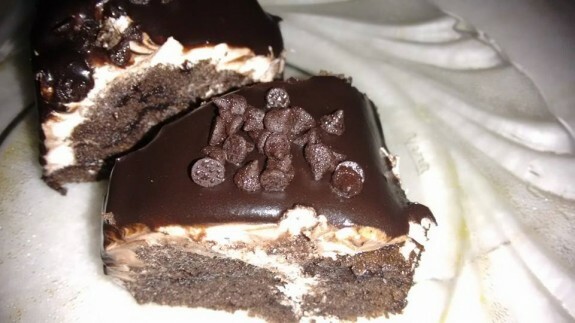 You can make 2 layer of the cake and sandwich the two by giving the chocolate cream in the middle. 10. In a bowl add the white cream and3-4 drops liquid chocolate to make chocolate cream. 11. Spread this cream on the top of the cake and garnish it with Chocó chips on top.